No one enjoys being ripped off. A study has revealed just one in 20 British travellers feels there is nowadays any value in duty-free airport or airline shopping. Online comparison site eDreams.co.uk surveyed two thousand people and found only 6% of them believe duty-free provides the most competitive price; 52% of those surveyed said they could find better prices online or on the High Street. eDreams also compared duty-free selling prices with those of general supermarkets and found many products cheaper in the supermarkets. If taking a trip within the EU there is, of course, no ‘duty-free’ qualification, as this only applies to goods taken outside of the EU. The outcome of Brexit may alter this position. Meanwhile if you’re travelling within the EU, there is no duty-free tax saving. Martin Lewis of MoneySavingExpert.com says only the World Duty Free shops can legally insist on our boarding passes — NOT any of the other airport shops. Their reason for requesting your boarding pass information is so they can claim the VAT refund (if you’re travelling outside the EU) for themselves — instead of reducing the prices of products, all of which are ‘duty-free’, by the 20% VAT exemption, which they are NOT doing. In Boots and WH Smith airport shops, on purchases over £5 and £6 respectively, they will refund you the VAT if you produce your boarding pass and are travelling outside the EU, but only on individual items over £5/£6, not the whole basket. In a Guardian news article, a former WH Smith employee at Manchester airport who wished to remain anonymous, was quoted as saying that ‘WHS staff were told to check boarding passes as part of an unexplained survey’. You can’t take your cheaper supermarket bottled water through security so you’re obliged to buy one airside. However, a good tip is to take your own empty sports water bottle along, then at zero cost you can fill it at one of the airport water stations available. And you’ll help reduce plastic pollution at the same time. Solicitor Nick Harris’ advice to holidaymakers is to ‘Get out your smartphone, then check the price’ on Google.com, Mysupermarket.co.uk, ebay.co.uk, or Amazon.co.uk and ‘see if it really is a bargain. ‘People going on holiday are a captive market and the duty-free shop-owners know this. They prey on people’s impulse to buy products if they believe they are getting a great deal’. ‘A spokesman for World Duty Free, which operate the duty free shops at major UK airports, commented: ‘We do not claim we can always beat online retailers or special offers. ‘But we sell more than 10,000 products across a wide range, offering consistent savings throughout the year.’ However, the sad fact is World Duty Free’s prices as listed online for UK airport outlets — versus prices at High Street shops and eCommerce sites show many products in a Major League Duty Free Rip Off cost two or even three times more than retail High Street Shops or ecommerce sites — despite having to add the 20% VAT. Though some claim there’s no scam, that it’s worth being able to conveniently purchase alcohol or perfume once through security, unrestricted by the Transportation Security Administration (TSA) 3.4 ounce/100ml limitation, “Duty Free” is free of value added tax and other such taxes on products taken out of the country. 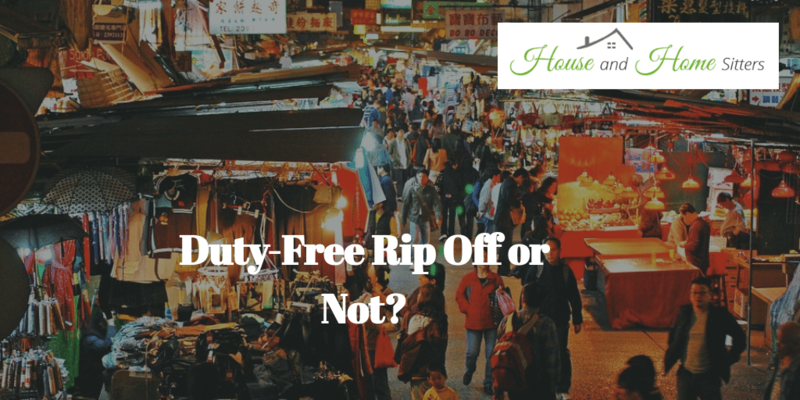 Our expectation and indeed our perception is for much lower prices duty-free than outside the airport or international flight, but of course, there’s no law against free enterprise or obliging the duty-free retailers to limit their prices. Airport rentals are sky high. Shop managers are under pressure to maximise profits. The main message to you, dear reader, is simply to be aware, and hopefully this article by House and Home Sitters will be of assistance to you.